The jaguar is a wild cat species and the only extant member of the genus Panthera native to the Americas. The jaguar's present range extends from Southwestern United States and Mexico across much of Central America and south to Paraguay and northern Argentina. Though there are single cats now living within the western United States, the species has largely been extirpated from the United States since the early 20th century. It is listed as Near Threatened on the IUCN Red List; and its numbers are declining. Threats include loss and fragmentation of habitat. The jaguar is the only extant New World member of the genus Panthera. Results of DNA analysis shows the lion, tiger, leopard, jaguar, snow leopard, and clouded leopard share a common ancestor, and that this group is between six and ten million years old; the fossil record points to the emergence of Panthera just two to 3.8 million years ago. The Panthera are thought to have evolved in Asia. The jaguar is thought to have diverged from a common ancestor of the Panthera species at least 1.5 million years ago and to have entered the American continent in the Early Pleistocene via Beringia, the land bridge that once spanned the Bering Strait. Results of jaguar mitochondrial DNA analysis indicates that the species' lineage evolved between 280,000 and 510,000 years ago. Phylogenetic studies generally have shown the clouded leopard (Neofelis nebulosa) is basal to this group. The position of the remaining species varies between studies and is effectively unresolved. Based on morphological evidence, British zoologist Reginald Innes Pocock concluded the jaguar is most closely related to the leopard. However, DNA evidence is inconclusive and the position of the jaguar relative to the other species varies between studies. Fossils of extinct Panthera species, such as the European jaguar (Panthera gombaszoegensis) and the American lion (Panthera atrox), show characteristics of both the lion and the jaguar. 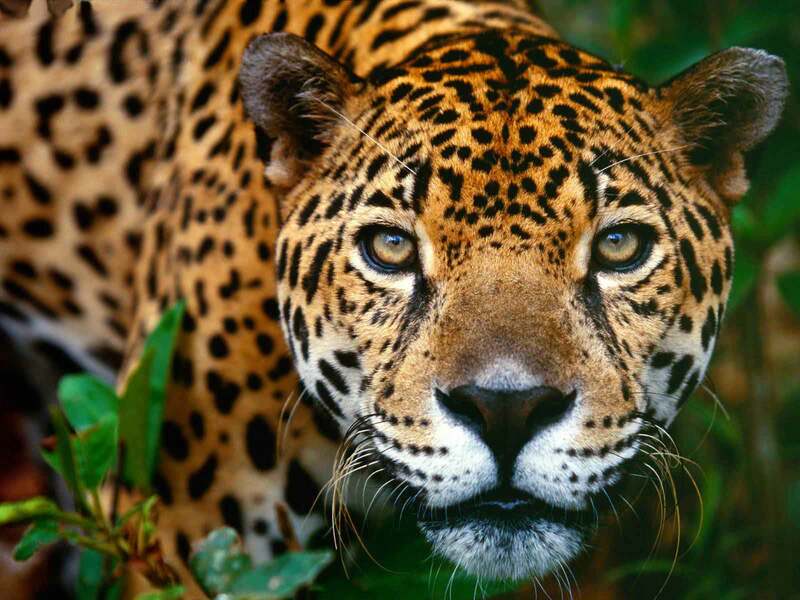 The jaguar, a compact and well-muscled animal, is the largest cat in the New World and the largest carnivorous mammal in Central and South America. Size and weight vary considerably: weights are normally in the range of 56–96 kg (124–211 lb). Larger males have been recorded to weigh as much as 158 kg (348 lb) (roughly matching a tigress or lioness; however note this animal was weighed with a full stomach). The smallest females have low weights of 36 kg (79 lb). Females are typically 10–20 percent smaller than males. The length, from the nose to the base of the tail, of the cats varies from 1.12 to 1.85 m (3.7 to 6.1 ft). Their tails are the shortest of any big cat, at 45 to 75 cm (18 to 30 in) in length. Their legs are also short, considerably shorter when compared to a small tiger or lion in a similar weight range, but are thick and powerful. The jaguar stands 63 to 76 cm (25 to 30 in) tall at the shoulders. Compared to the similarly colored leopard, the jaguar is bigger, heavier and relatively stocky in build. Further variations in size have been observed across regions and habitats, with size tending to increase from the north to south. A study of the jaguar in the Chamela-Cuixmala Biosphere Reserve on the Mexican Pacific coast, showed ranges of just about 50 kg (110 lb), about the size of a female cougar. Jaguars in Venezuela or Brazil are much larger with average weights of about 95 kg (220 lb) in males and of about 56 kilograms (123 lb) to 78 kilograms (172 lb) in females. In the Brazilian Pantanal, weights of 136 kilograms (300 lb) or more are not uncommon in old males, with the highest recorded weight, for a Jaguar weighed on an empty stomach being 148 kilograms (326 lb). Forest jaguars are frequently darker and considerably smaller than those found in open areas (the Pantanal is an open wetland basin), possibly due to the smaller numbers of large, herbivorous prey in forest areas. A short and stocky limb structure makes the jaguar adept at climbing, crawling, and swimming. The head is robust and the jaw extremely powerful, it has the third highest bite force of all felids, after the tiger and lion. A 100 kg (220 lb) jaguar can bite with a force of 503.6 kgf (1110 lbf) at canine teeth and 705.8 kgf (1556 lbf) at carnassial notch. This strength adaptation allows the jaguar to pierce turtle shells. A comparative study of bite force adjusted for body size ranked it as the top felid, alongside the clouded leopard and ahead of the tiger and lion. It has been reported that "an individual jaguar can drag an 800 lb (360 kg) bull 25 ft (7.6 m) in its jaws and pulverize the heaviest bones". The jaguar hunts wild animals weighing up to 300 kg (660 lb) in dense jungle, and its short and sturdy physique is thus an adaptation to its prey and environment. The base coat of the jaguar is generally a tawny yellow, but can range to reddish-brown, for most of the body. However, the ventral areas are white. The cat is covered in rosettes for camouflage in the dappled light of its forest habitat. The spots vary over individual coats and between individual jaguars: rosettes may include one or several dots, and the shapes of the dots vary. The spots on the head and neck are generally solid, as are those on the tail, where they may merge to form a band. While the jaguar closely resembles the leopard, it is sturdier and heavier, and the two animals can be distinguished by their rosettes: the rosettes on a jaguar's coat are larger, fewer in number, usually darker, and have thicker lines and small spots in the middle that the leopard lacks. Jaguars also have rounder heads and shorter, stockier limbs compared to leopards. Color morphism occurs in the species. A near-black melanistic form occurs regularly. Jaguars with melanism appear entirely black, although their spots are still visible on close examination. The black morph is less common than the spotted form, but at about six percent of the population, it is several orders of magnitude above the mutation rate. Hence, it is being supported by selection. Some evidence indicates the melanism allele is dominant. The black form may be an example of heterozygote advantage; breeding in captivity is not yet conclusive on this. Melanistic jaguars (or “black” jaguars) occur primarily in parts of South America, and are virtually unknown in wild populations residing in the subtropical and temperate regions of North America; they have never been documented north of Mexico’s Isthmus of Tehuantepec. Melanistic jaguars are informally known as black panthers, but (as with all forms of polymorphism) they do not form a separate species. Extremely rare albino individuals, sometimes called white panthers, also occur among jaguars, as with the other big cats. As usual with albinos in the wild, selection keeps the frequency close to the rate of mutation.